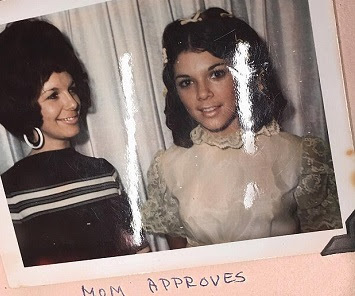 Kim Kardashian shared an adorable photo of her mother Kris Jenner with her mom Mary Jo Shannon in the 1970s on Instagram on Sunday. And it's easy to see where the genetically blessed Kardashian gets her sultry good looks from. Kris, 61, is the splitting image of Mary Jane, affectionately called MJ by the family. Kim, 36, captioned the snap, simply: 'My grandma MJ & my mom' with the words 'mom approves' seen under the photo in the book.